E-HORS (Electronic Hotel Operations and Reservation System) is an innovative software suite of fully integrated applications that will fulfill every need of a hotel's operations and management. System with Internet browser support Adobe Flash Player. Internet with prefer SDSL 1Mbps Up & Down Link. 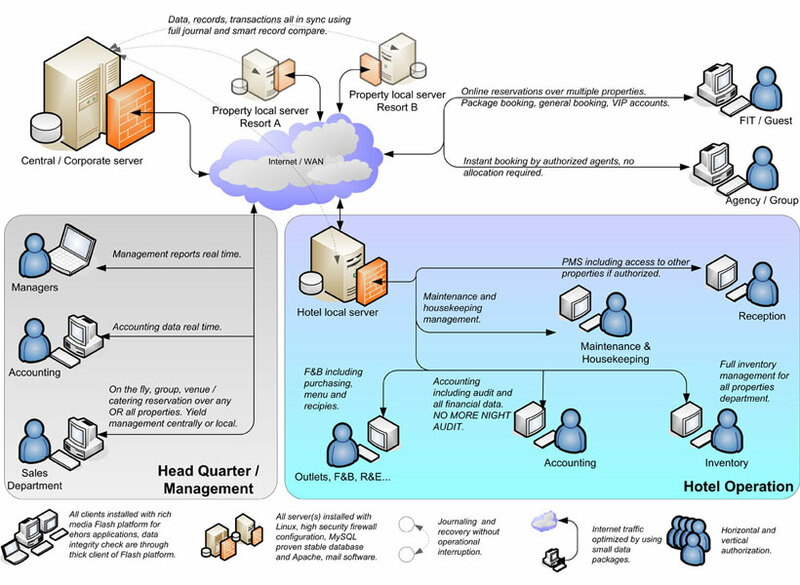 Conceptual Overview Click on image to zoom. E-HORS modules consist of Front Office, Online Reservation, Housekeeping & Maintenance, Purchasing, Food & Beverage, Point of Sales, PABX phone system, Accounting, Service Centre, Unit Lease Back, Agencies & Groups, Human Resources, Sales & Marketing and Venue & Catering. E-HORS is web-based and the system is accessible from anywhere in the world with internet access and if the user has proper authorization. Management information can be produced per property as well as consolidated over multiple properties and all data is real time. E-HORS servers are both masters. This also means that if the Intranet server is down, hotel staff can continue working on the Internet server, which guarantees a very high level of uptime. Night audit is not required within the E-HORS software solution. Room charges and such are processed through batch procedures and there is no need to close the day, shut down and make backups. E-HORS is a breakthrough product, developed with the hospitality industry in mind to improve its efficiency and increase guest satisfaction. Thus, E-HORS has created history with a long list of firsts. EHORS as our product we had achived serveral "first" in hospitality system industry. First 100% web based hospitality solution. E-HORS can run on any web browser which supports Adobe Flash Player. High levels of security have been implemented. No source code or any data is readable in the HTML source code. E-HORS can run in a single browser window. First hardware independent solution for workstations. E-HORS runs perfectly in an “Open Source” environment, keeping investments low. Apple and tablets devices are supported. First uniquely set up pair of a local and central server, resulting in virtually no down time. E-HORS runs simultaneously and functionally complete on both the local server (in the hotel) and the central server (in a datacenter), resulting in no down time at all so far. First fully integrated real time solution without the need for import or export of files. A common situation in a property is a number of island solutions and all of these solutions require their own server. Therefore an average of 5 servers is not unusual. E-HORS runs on a single local server and uses a single database. E-HORS is always 100% real time. First without night audit, closing and manual back up. All activities done manually during the night audit are done automatically by E-HORS. Due to the conceptual design of E-HORS, the good old tape back-up is no longer needed. Day closing with the consequence of wrongly posted revenues is no longer an issue. Therefore, human errors can be minimized significantly. First without the technical need for allocations, E-HORS is 100% real time and works with an open inventory. Allocations can kill the occupancy of a property. With currently cut off days of 3 to 5 days before check in, the property allows high overbooking percentages or faces low occupancy. Both are dangerous and potentially cost significant amounts of money. Due to the fact that E-HORS works with an open inventory and E-HORS is 100% real time, including online reservations, allocations are no longer needed. First truly multi property solution. Currently so called “central” reservation systems are all based on room allocation. In E-HORS, the reservation system is automatically a central reservation system and the full inventory is available (rooms and venues). Staff can be authorized to work remotely in multiple properties at the same time. Cross property bookings can be made without consulting the involved properties. All E-HORS modules are multi property, including accounting, F&B, purchasing etc… This allows far more than just central reservations, but also central purchasing, central recipe generation and other functionalities. Basically all functions can be centralized. The E-HORS IP phone system can create one virtual environment where all phonecalls between properties are free of charge. First PMS that is practically paperless. All paperwork can be replaced by email documents in PDF format. Breakfast vouchers and package vouchers can be managed in E-HORS programs where they are supposed to be used. Quotations, deposit receipts, invoices, purchasing documents and approval cycles are all done electronically and there is no need to print any documents. Even purchase orders can be sent by email in PDF format. First system with a fully integrated IP Phone system. Only one infrastructure is needed for telephone and Internet within the property as well as the guest rooms. Investment can be reduced tremendously. All phone calls within the organization (local, national or international) are all free of charge. Connections with fixed lines and mobiles can be achieved with an IP telecom providers against very competitive rates resulting in higher profits. First solution that provides full set of reports online and real-time. Currently properties create their management reports using spreadsheets. E-HORS provides all reports online and real-time in the format and output tailored to the needs of the customer and is included in the annual support and maintenance fee. This is absolutely unique in the market. First technical infrastructure that allows remote Facility Management from anywhere to anything. E-HORS has the ability to deliver the highest level of support possible and resolve many problems remotely. First truly multilingual user interface based on user ID. Unlimited number of languages can be added by the user. A simple user interface allows the customer to create any language for all E-HORS texts, including system messages.